We are German KRAFT Brewery, a ‘craft’ brewery rooted in German tradition, bringing the freshest and purest beer to the world. Our Brewery utilises an exclusive water distillation and mineralisation technology that allows us to create German spring water or any water profile fitting to our beer styles to optimise their natural flavour. We not only brew after the German purity law from 1516 but mainly use traditional German hops and specialty malts from our Franconian malthouse, Steinbach Mälzerei, thereby creating a beer rooted in tradition yet given an edge by its modern twist. Our highly controlled brewing process with state-of-the-art equipment allows us to create consistently high-quality brews; unfiltered, unpasteurised and without additives or preservatives. This results in the beer having a short shelf life but it’s nearly exclusively served fresh from the tank and keg at our taproom for optimal quality. Our environmental policy is one of the most progressive today. Through our water distillation and mineralisation process we are able to utilise the waste heat from our lager tanks, and bottle any excess mineral water for the community market. Furthermore, our beer is only consumed freshly from our serving tanks, stell kegs or refillable growlers, which are inspired both by traditional German beer consumption, and the German Pfand system. 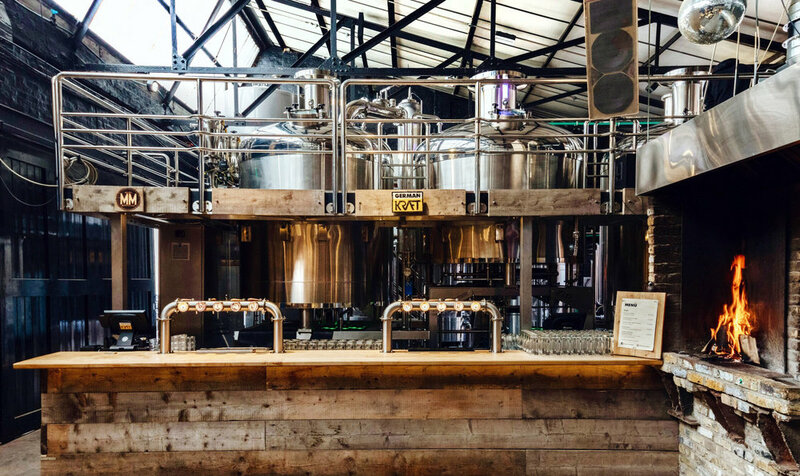 You will find our beer served at our taproom in Mercato Metropolitano, Elephant & Castle but also at Steins in Richmond, the Petersham Nursery, Covent Garden and at the Ministry co-working space.